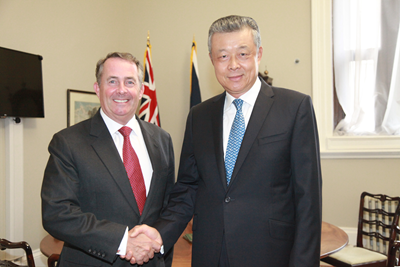 On September 4, 2017, Ambassador Liu Xiaoming met with Liam Fox, UK Secretary of State for International Trade and exchanged views on China-UK relations, economic and trade cooperation between the two countries, and international issues of common interest. Secretary Fox said that, in the context of the rising protectionism, the UK and China share a common interest in supporting economic globalization and advocating free trade. The UK has sound business environment, apparent advantage in law, finance and language, and greater autonomy after Brexit. There are great potential and broad prospects in UK-China trade and investment and cooperation on the Belt and Road Initiative. He hoped that the two sides could seize the opportunities to promote UK-China economic and trade cooperation to achieve more tangible results. Ambassador Liu noted that this year marks the 45th anniversary of China-UK ambassadorial relations, and it is also a year for consolidating the "Golden Era" of China-UK ties. The relation of the two countries is at a new historical starting point. He expressed the hope that the two sides would work together to plan the high-level exchanges for the next stage, make full and good use of the dialogue and communication mechanisms at all levels, and further deepen mutually beneficial cooperation in various fields. China is willing to strengthen multilateral cooperation with the UK, jointly oppose protectionism, support the multilateral trading system, and promote an open world economy. He hoped that the UK would create a more favorable environment in institution, policy and public opinion for Chinese enterprises to invest in the UK so that China-UK relations could bear more "golden fruits" in the "Golden Era".